Cold therapy works best when the ice is applied immediately after an injury or leaving a repetitive stress activity. But sometimes, one is not close to a freezer to grab a cold pack. 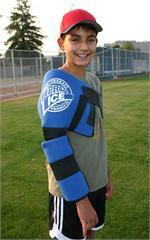 Pro Ices youth pitchers kit allows for portability while keeping the cold therapy wrap at the optimal icing performance. The cooler bag will keep the ice insert at an ideal temperature for up to eight hours. The additional ice insert doubles the potential icing time; simply remove one insert and insert the other to continue icing. While it is called a pitchers kit, its uses extend beyond baseball. Anyone with shoulder/elbow injuries or overuse can benefit from the convenience provided by this kit. Includes a youth shoulder/elbow wrap (PI 220), extra ice insert (PI 221) and cooler bag (PI 600). Pro Ice outperforms any cold pack on the market and with our youth pitchers kit, allows for use wherever, whenever its needed. For shoulder/elbow pain that wont subside, or to be ready for the next game, add another Pro Ice cold therapy insert to your order and double the relief. Fits youth shoulder/elbow wrap (PI 220).